1st D.C.L.I. 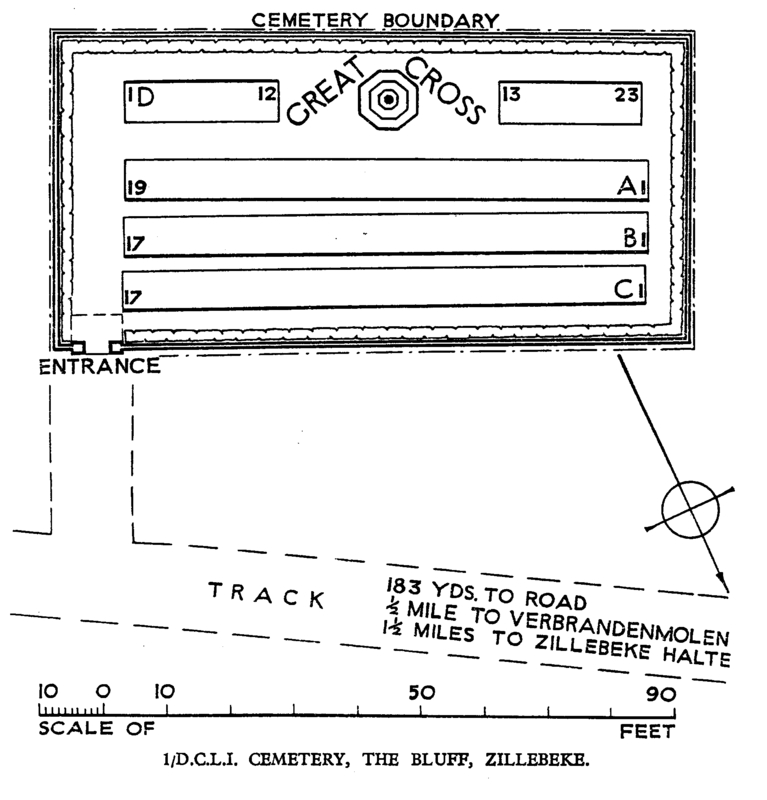 Cemetery, The Bluff. 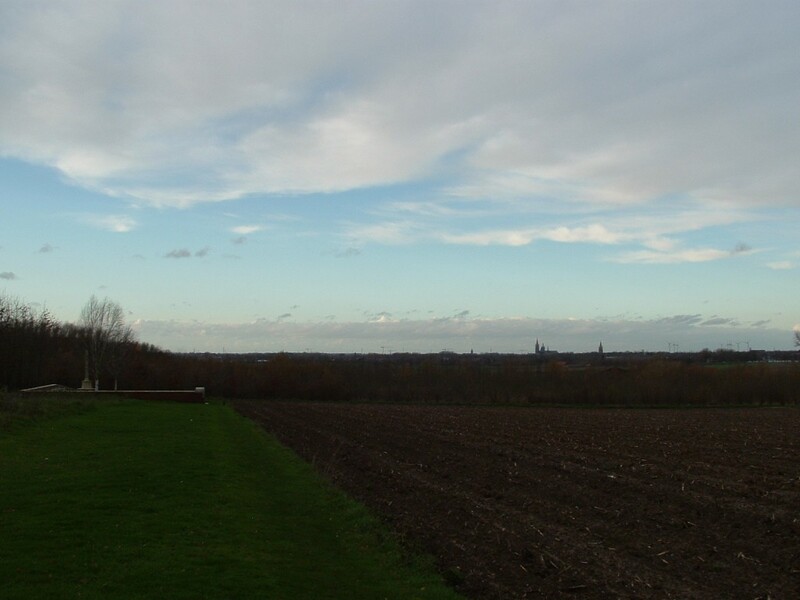 The spires of Ypres on the horizon show not only how close the front lines here were to the city in 1915, but also how strategically important this slightly higher ground was to whoever could claim it, and why it was so hotly contested by both sides for much of the war. 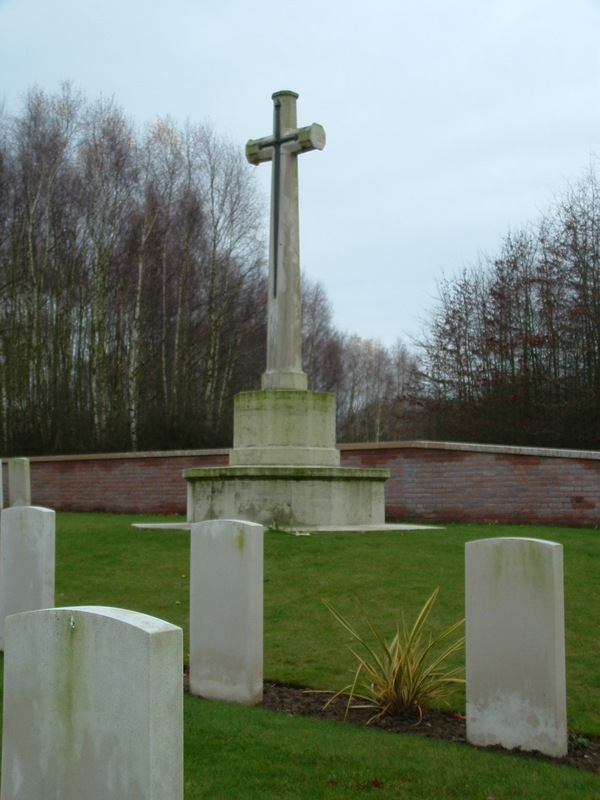 As its name implies, the cemetery was originally used by the men of the Duke of Cornwall’s Light Infantry during the fighting here between April and July 1915. 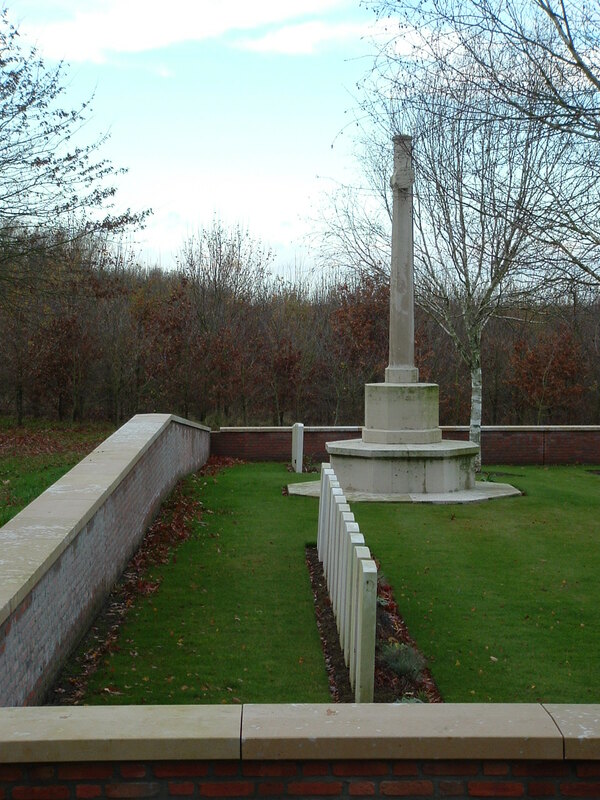 It was not used again until after the war when a number of isolated graves, also from the fighting in 1915, were brought in from the surrounding battlefield and reinterred on either side of the Cross of Sacrifice in Row D (above). Looking west across the cemetery. 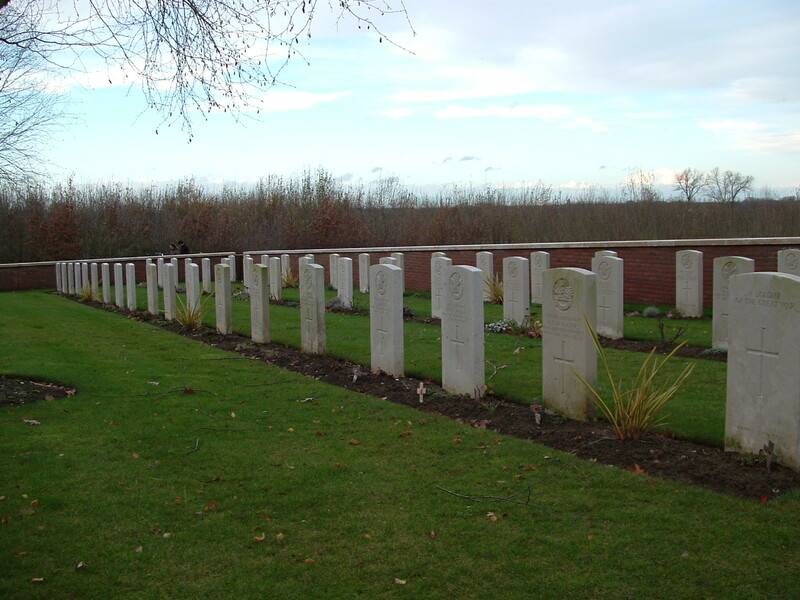 The three rows in the foreground are the original burials; Row D is furthest from the camera. Row A in the foreground with Rows B & C behind. All but two of the graves in these three rows are D.C.L.I. men. 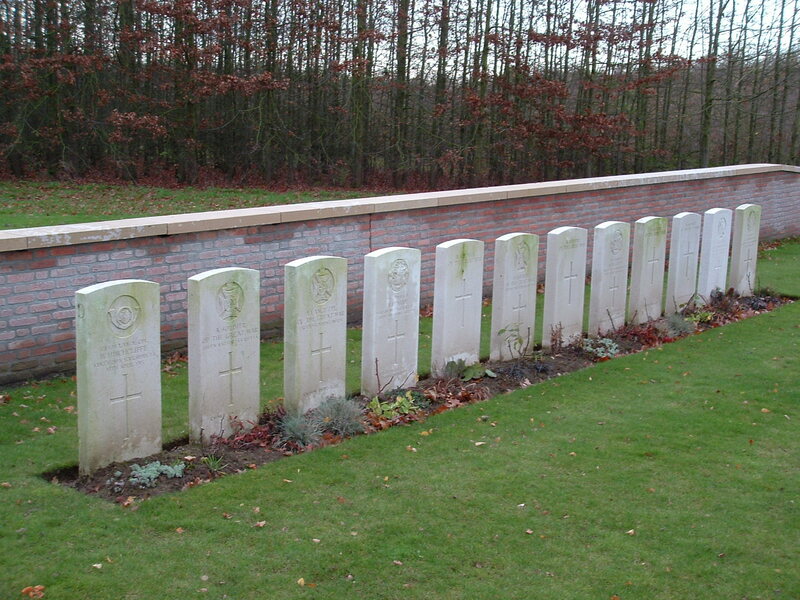 There are 13 unknown soldiers amongst the 76 graves here. 1st D.C.L.I. 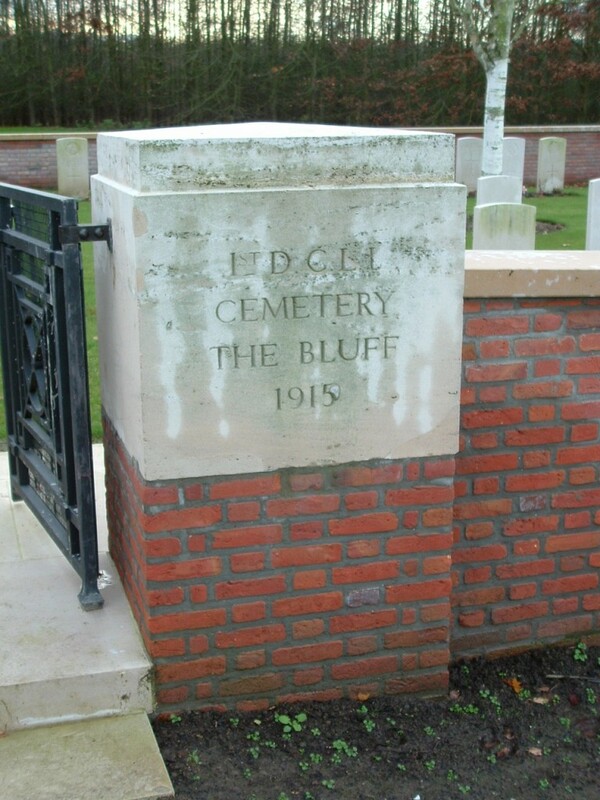 Cemetery, The Bluff stands in splendid isolation on the slope of the ridge. 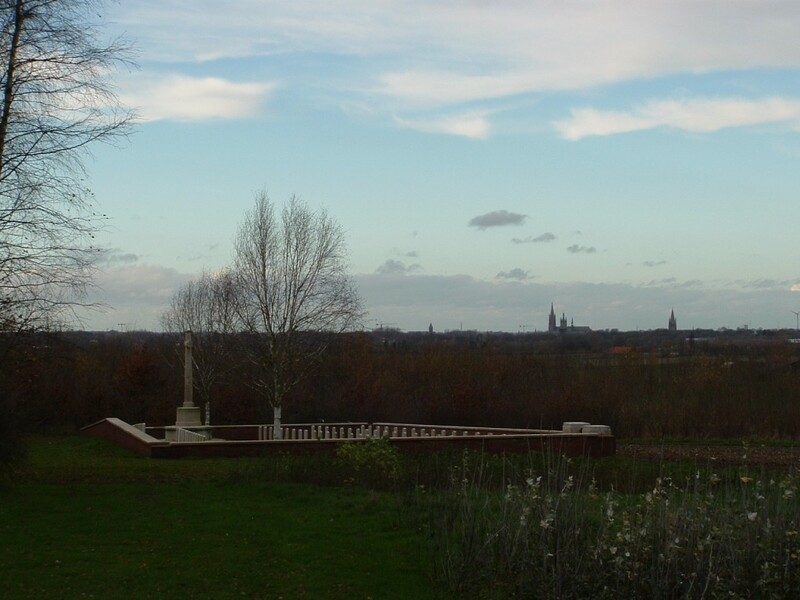 This is a tranquil place during the summer, with the sun shining and the crops growing high in the field alongside, but personally I like this little cemetery during the winter months, when the trees are bare and the air is clear and cold and the view to Ypres away to the west uninterrupted. Ah well, enough waxing lyrical. 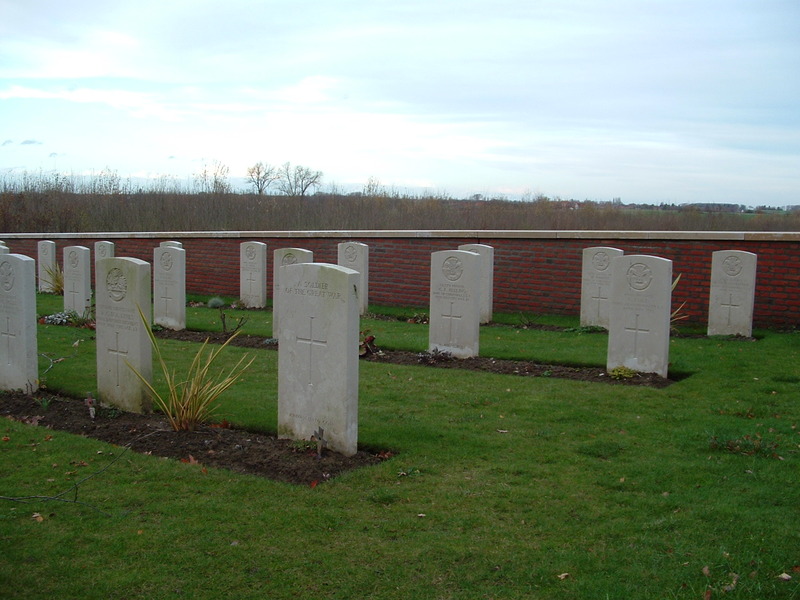 Onwards to Woods Cemetery. Thank you for taking such lovely pictures of this very special place. 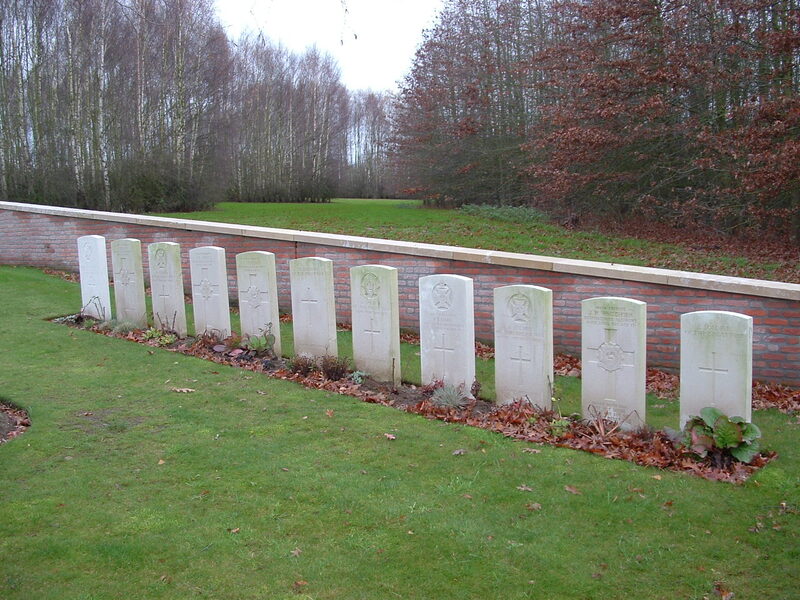 My Great Grandfather William Hinchcliffe is buried in plot D1. I have sent these images to my Mother. And thank you for your kind comments Lisa; the cemeteries on the Bluff are special places indeed. Lovely pictures, thank you. I visited the Cemetery as part of a Remembrance centenary visit last week. 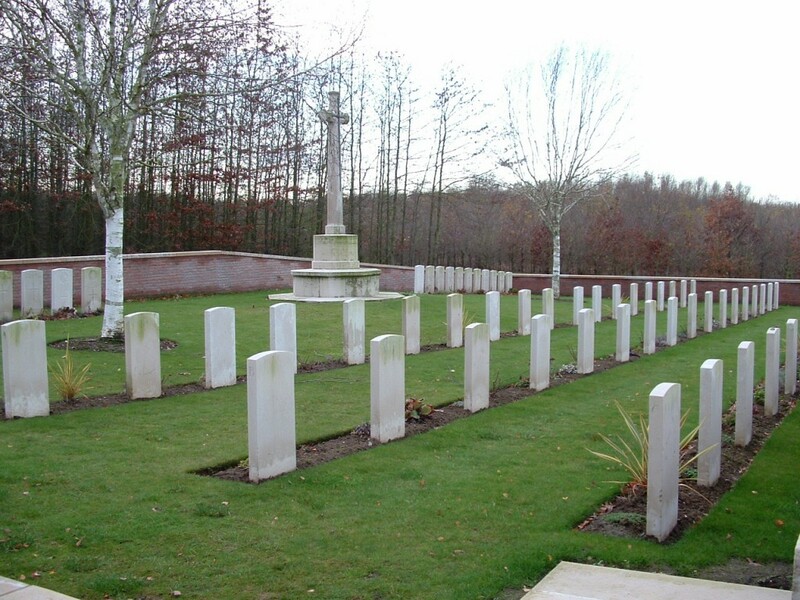 Based on records of the movement and reburial of the neighbouring bodies, there is circumstantial evidence that the ‘unknown’ soldier of the Devonshires, buried in D.18, is in fact my Great Uncle Pte George Griffin. 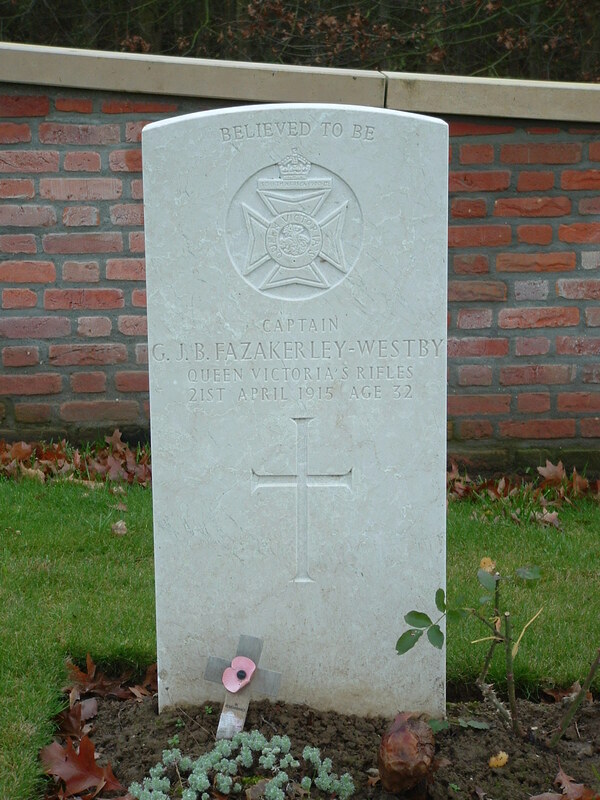 But I’ll probably never be able to establish it beyond doubt, and it matters not – he is at peace now. Very interesting to hear you Great Uncle’s story. 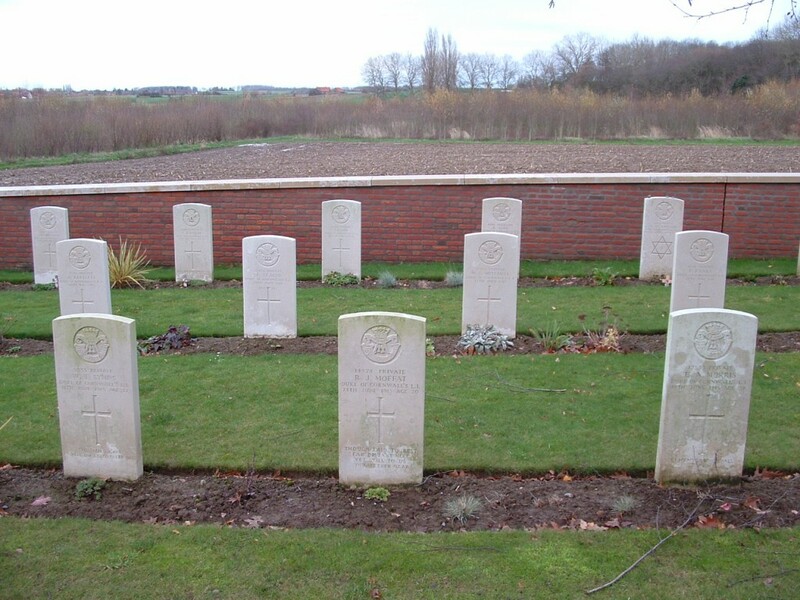 No, you are right, it matters not, but I wonder what evidence the CWGC need to agree to a DNA test?